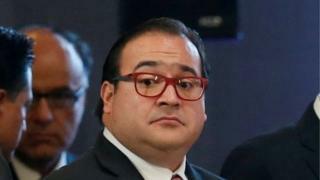 Mexican police have raided a ranch belonging to the former governor of the state of Veracruz, Javier Duarte. Mr Duarte stood down from his post in October to face corruption charges and disappeared a week later. Officers searching his luxury ranch seized 17 paintings believed to be by famous artists such as Joan Miro, Fernando Botero and Leonora Carrington. Police continue to search for Mr Duarte, who has been charged with organised crime and money laundering. Mr Duarte denied the accusations made against him before his disappearance but has not spoken out since. Disappearing Duarte: Where has he gone? Veracruz Governor Miguel Angel Yunes Linares, who took over as governor last week, said the works of art seized on Sunday would be auctioned off. The proceeds would be used to finance a children's hospital, he said. Mr Yunes alleged that the property had been furnished using money siphoned off from public funds. "More than 200m pesos ($9.7m; £7.6m) stolen from the people of Veracruz were spent doing up this house so that Duarte could have people over, now he won't host anything any more," he said. Officials said the paintings would still have to be verified by experts but they believe they are dealing with works by Mexican painters David Alfaro Siqueiros and Rufino Tamayo, Spanish artist Joan Miro and English-born Mexican painter Leonora Carrington. Officers also found a sculpture by Mexican artist Javier Marin and copies of historic documents such as Mexico's Declaration of Independence. They said the combined value of the works of art seized would still have to be determined. They had been stored in a cellar in Mr Duarte's weekend retreat. The ranch has 25 rooms, a helicopter landing pad, two tennis courts and extensive grounds just outside the city of Cordoba, in north-eastern Veracruz.